Durham: Frank Berkes passed away on January 13, 2019 at the age of 84 following a lengthy battle with progressive dementia. Frank was born in Buziaș, Romania on January 10, 1935, the son of the late Stefan Berkes and Katharina Marschall Berkes. He is survived by his wife of 57 years, Lynn Louise Wagner Berkes; their children, Sally Berkes McGee (Peter McGee), Katherine Berkes Salmans (James Salmans), Stefanie Berkes Whitlow (Michael Whitlow), and Rosie Berkes Rubio (Fransisco Rubio); eight grandchildren, Mitch and Nicholas McGee, Karaline Salmans Goldmark and Kasidy Salmans, John and Katelynn Whitlow, and Victoria and Logan Rubio; also, four great grandchildren, Brylee and Evelyn McGee; Sona and Ziva Mcgee. Escaping from communist Romania to Austria in 1947 at the age of 12, Frank later emigrated to the United States with his parents and brother in 1951. Frank served in the United States Air Force from 1956 to 1959. 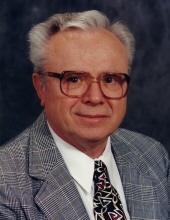 He earned a degree in mechanical engineering from the Milwaukee School of Engineering in 1962. During his time in Milwaukee, Frank met Lynn Wagner. They were married on April 1, 1961 and settled in Milwaukee, Wisconsin where they had two girls. In 1968, Frank was offered a position at Triem Incorporated in Carrboro, NC which prompted the move south where they had two more girls. Frank enjoyed a long and successful career as a design engineering manager at Durham Products. The company was an electric motor manufacturing facility for blowers, draft inducers, and pump systems. His strong work ethic, analytical mind, and penchant for solving difficult problems earned him the respect of his colleagues. More importantly though, his ability to nurture and encourage his employees left behind a legacy of love and respect from those who worked for him. A talented artist, Frank had a spirit for adventure with a slight streak of rebellion. He enjoyed exploring places off the beaten path. Additionally, throughout his entire life, Frank was an avid gardener, and he worked tirelessly in his yard. He spent countless hours serving on the board of the Parkwood Homeowners Association and volunteered his time and energy to improving the community and the betterment of the parks in the neighborhood. A long-time member of the Parkwood United Methodist Church, he traveled all over North Carolina participating in lay witness missions. The visitation will be held on Friday, January 18, 2019 from 6-8 PM at Clements Funeral Home at 1105 Broad Street, Durham, NC 27705. Funeral services will be held Saturday the 19th at 11 AM at Parkwood United Methodist Church, 5123 Revere Road, Durham, NC 27713. In lieu of flowers, memorial contributions may be made to Parkwood United Methodist Church, 5123 Revere Road, Durham, NC 27713. (Please note “In memory of Frank Berkes” with any donations). To send flowers or a remembrance gift to the family of Frank Berkes, please visit our Tribute Store. "Email Address" would like to share the life celebration of Frank Berkes. Click on the "link" to go to share a favorite memory or leave a condolence message for the family.